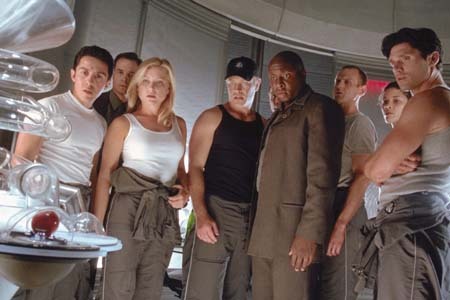 Keri Allan: What stage you got involved with Minority Report? 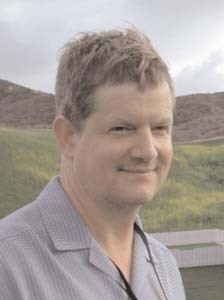 Alex McDowell: Pretty much at the beginning of Steven Spielberg's involvement. The film had been around for quite a while with different directors at Fox, but once Steven got involved he hired Scott Frank, the writer, and myself more or less at the same time. So I was on for about 10 months and then he shut down to do A.I. and then we stopped and I went to do another film, and then came back and started again, did another 10 months prep and then the shoot. KA: What did your work involve? AM: The production designer is kind of responsible for the look for the film, and the frame of the film so my process is to start off showing the director - in this case after a conversation with Steven I had to show him a lot of visual references - magazines and books and pictures to get an idea of direction, and then start moving into conceptual art. I hired about six Photoshop artists who were working on conceptualising the ideas as the script, or notes from the script, started coming in. And then, as things started getting solidified, we'd start set designers and art directors working on actually making the drawings of designs for the sets. And then, as those starting getting solidified, we would start to bring in construction team and set decorators and start looking for locations. 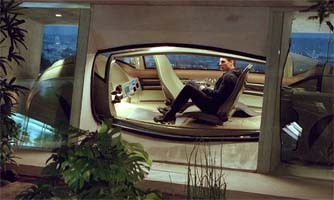 I am kind of responsible for all of that and then prop design and researching - in the case of Minority Report that meant all the technology and futuristic elements of the way technology and society might develop. We did a lot of research by talking to scientists and futurists about what they thought would happen in the future. We had to work within the parameters of what Spielberg wanted - a utopian kind of non-post apocalyptic, a good clean future where ecology is in place and on the surface appears to be a kind of healthy, functioning development of the society we live in now. KA: Where there already ideas for the look of the movie in the script or did these come mainly from Spielberg? AM: I think it was a combination, but on the whole with the visual effects side of things Steven had a clear idea. He had a lot of ideas he wanted to develop, some of those things ended up going into A.I. We developed a sleeping environment where the cover of the bed would close down and you could programme your environment to be, for example, a forest. Then it would feel like you were sleeping in a forest. This idea ended up being used in A.I. Spielberg is very interesting as he is constantly coming up with ideas. In absence of a script, which is how we started, we just developed a lot of ideas in the abstract, to see where we could take them and then present them back to Steven and see if he would like them. Out of that the Maglev transportation design was developed. We knew that there would always be pre-cogs in the film so at a very early stage we started working on the pre-cogs. Steven liked the direction, he liked the fact that there were three of them, and once we set up the design that they were laying head to head in that sort of Mercedes symbol, he wanted to develop that as the pre-crime logo, and then we kind of went in a very straight line in the way we developed some of those designs, so we kind of knew -pre-crime design we kind of knew about very early on, that sort-of sophisticated it as the film went along, made it smaller more compact, more shootable, but overall those pre-cog pre-crime designs were pretty much in place in the beginning. Because there wasn't a script at first we started off by looking at the world as a whole and asking ourselves what would the world look like in Washington DC something like 2040? The art department came up with things like what the architecture was like, the way that the environment around the city would develop, what the cars would look like. 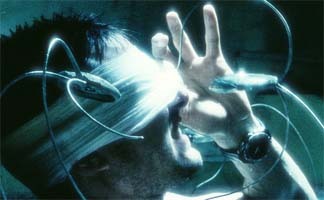 They also started looking into what watches and communication devices would look like, what the computers would look like and how they'd work. As the script came in we were able to narrow things down more and more and we were able to get more and more specific about the day to day life of Anderton. My approach is not to separate the production design and the visual effects design, at least at the beginning I start conceptualising the film as a whole. Then as the visual effects come in, we try and give them conceptualisation of the film as we see it. Sometimes it doesn't really all come together until we've started filming, so there's a long part of the design process where we're talking about the design as a whole, and collaborating with all of the various departments to see what's the best and most sufficient way of getting the design onto the screen. KA: Was there a limit on how much CGI you could use, or did it depend on the scene? AM: I think it was completely depended on what the script needed in the end. Certainly there's always a limit, Steven is very clear about how much money he wants to spend on a film. But in order to get to that point where you know how much something's going to cost you have to develop the design to a certain point in order to see whether he likes it to see how much screen time he wants. With CG a lot of the time we are trying to make the number of shots more efficient in order to keep an idea in the film. Then you need to work out how important the effect is in the story. 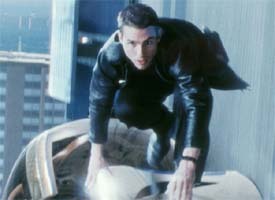 Originally we developed a moving walkway systems where Tom Cruise was escaping from the cops but in the end Steven decided it was going to cost too much money, in comparison to how much value it had to the story, so we cut it down to just one little walkthrough. KA: Do you have a favourite effect? 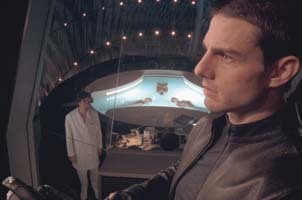 AM: I think that one of the most successful ones was the hall of containment where he goes to find the Ann Lively murderer, he goes out on the moving walkway out onto the middle of the set and all of those pre-criminals come out of the ground in their vertical tubes and I think that that was something that was visualised completely in the computer. It was done very specifically to the number of shots Steven wanted and then step by step we built some of those tubes for real. While some of them moved most of them were visual effects. The images that were playing on their screens were a whole other layer and I think that whole sequence came out exactly as everyone wanted it to and was really successful. KA: Any shots that were problematic? AM: The car factory set was a hard one to do. We were going to do a big set extension for that in CG but in the end we didn't. I think the only CGI work in that scene was the laser beams in the end. The one scene that I thought was seamless, and I'm not sure how many people knew it was shot in a complete CG environment, was the ending on the rooftop. That set was built on stage and the entire background was a CG element and that was really seamless I thought they did a fantastic job there.